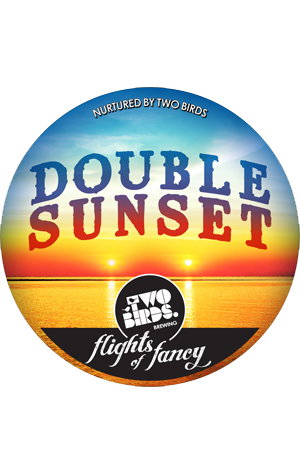 Back in May, Two Birds Brewing continued a remarkable couple of years of awards success by taking out both a Champion Brewery title and Best Amber / Dark Ale at the Australian International Beer Awards. To mark their wins, they set about taking the beer that won said trophy, their Sunset Ale, and beefed it up. A little like one of head brewer Jayne Lewis' alma mater, Mountain Goat, who created Double and Triple Hightails to mark important anniversaries, they concocted a Double Sunset. The story is that it has the same percentages of the same eight malts as the normal Sunset Ale, but added in such volumes that they couldn't possibly squeeze any more in. to this was added twice the usual amount of hops in the kettle plus a double dose of Citra, Galaxy and Cascade once in the fermenters. The result, we're told is "luscious with rich, toffee malt notes and grapefruit hops."